Walsall beat Preston to claim a first league win of the season as Andy Butler made a successful return to Bescot. Romaine Sawyers met an early Adam Chambers pull-back to put the Saddlers one up before Jordan Hugill squared for Joe Garner to level by half-time. Tom Bradshaw met Anthony Forde's cross to head Walsall back on 49 minutes. But, after Hugill was sent off for reacting to a solid challenge from on-loan Butler with an apparent headbutt, Paul Downing headed home the clincher. The Walsall stand-in skipper, deputising for the injured Sam Mantom, met another Forde corner, to plant a near-post 76th minute header - just after the visitors had been reduced to 10 men. 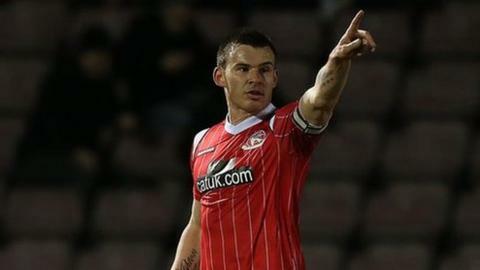 Former Saddlers captain Butler, who rejoined the club on loan from Sheffield United in midweek, lasted the full 90 minutes on his first league appearance of the season. Walsall, for whom Bradshaw struck his fourth goal of the season, climb to 18th, just two points behind 10th-placed Preston, who suffered their first defeat of the campaign. "A well deserved victory against a really good team and we had to be strong because they're a strong and powerful team. 'We scored some good goals which was really pleasing. "The cross from Anthony Forde and the run and the header from Tom Bradshaw were fantastic for the second goal. "There were a lot of players there today who could be first team starters as well, so it shows we've got strength in depth." Match ends, Walsall 3, Preston North End 1. Second Half ends, Walsall 3, Preston North End 1. Attempt saved. Alan Browne (Preston North End) left footed shot from the centre of the box is saved in the bottom right corner. James O'Connor (Walsall) wins a free kick in the attacking half. Attempt missed. Kevin Davies (Preston North End) right footed shot from outside the box is high and wide to the right. Attempt missed. Anthony Forde (Walsall) right footed shot from long range on the left is high and wide to the right. Attempt missed. Bailey Wright (Preston North End) header from the centre of the box is close, but misses the top left corner. Corner, Preston North End. Conceded by Paul Downing. Attempt blocked. Bailey Wright (Preston North End) right footed shot from the centre of the box is blocked. Attempt missed. Malvind Benning (Walsall) left footed shot from outside the box is high and wide to the right. Attempt missed. Billy Clifford (Walsall) right footed shot from the centre of the box is close, but misses to the left. Corner, Walsall. Conceded by Bailey Wright. Substitution, Walsall. James Baxendale replaces Romaine Sawyers. Corner, Walsall. Conceded by Tom Clarke. Calum Woods (Preston North End) wins a free kick on the left wing. Attempt saved. Joe Garner (Preston North End) header from the centre of the box is saved in the top right corner. Substitution, Preston North End. Kevin Davies replaces Chris Humphrey. Goal! Walsall 3, Preston North End 1. Paul Downing (Walsall) header from the centre of the box to the top left corner. Assisted by Anthony Forde following a corner. Attempt missed. Chris Humphrey (Preston North End) right footed shot from the right side of the six yard box is high and wide to the right. Malvind Benning (Walsall) is shown the yellow card. Richard O'Donnell (Walsall) is shown the yellow card. Jordan Hugill (Preston North End) is shown the red card. Jordan Hugill (Preston North End) wins a free kick in the defensive half. Attempt saved. Romaine Sawyers (Walsall) header from the centre of the box is saved in the centre of the goal. Attempt blocked. Billy Clifford (Walsall) right footed shot from outside the box is blocked. Attempt missed. Neil Kilkenny (Preston North End) right footed shot from outside the box is high and wide to the right.